I’m a huge fan of author Adam Baker and the books he’s written, to the extent that he’s one of the very few authors whose work I continually revisit, usually at least on a monthly basis. I was first introduced to him through a chance encounter in a hospital second-hand book carousel with Outpost, the first novel in his Spektr zombie series, which I still consider to be one of the most original and innovative contributions to the undead genre in a very long time. I’d read every single novel in the series when it was announced that Mr Baker would be beginning a new series – this time historical fiction set in feudal Japan. Now, this isn’t usually the kind of fiction that I’d ever pick up, not usually being interested in the genre or subject; but Mr Baker is one of the few authors that I enjoy so much that I’m happy to follow them in whichever direction they decide to go with their writing. As such, when it was published I picked up Winter Raven, the first novel in the Path of the Samurai series, and I was deeply impressed by what I encountered within its pages. Above all else, this was because it was so radically different to what I’d encountered from the author previously. Baker’s zombie novels are characterised by sharp, precise prose that has been pared down to deliver the utmost impact with the fewest syllables; intense, brutal and desperate action scenes by poorly-prepared characters fighting short-lived battles against an unbeatable undead foe; and a deeply nihilistic approach to the undead that acknowledges, as so few titles in that genre dare to do, the futility inherent in trying to fight the living dead. In comparison, reading Winter Raven was like encountering a completely different author – the prose, characterisation, atmosphere in the book were entirely unlike his previous titles, which I see as the mark of an incredibly skilled writer. Winter Raven was a much slower and thoughtful book that really took its time in developing the characters of a nameless Samurai journeying through Japan, and the young girl he had taken as his ward. The prose became softer, more lyrical and often deeply thoughtful, deftly matching the pace of the book, although Baker’s trademark swift and brutal action scenes remain to link his two series together thematically. I enjoyed the title immensely, and said at the end of my original review that I couldn’t wait to read the next in the series; and I was excited to learn recently that that day had finally come. 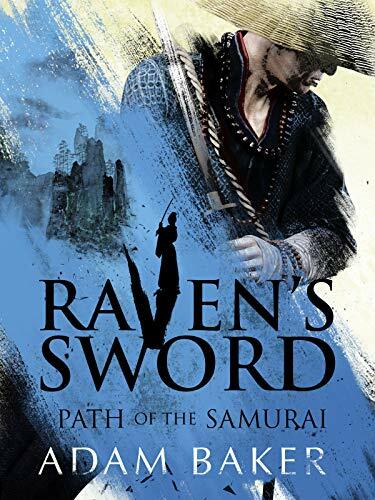 I spotted Raven’s Sword on NetGalley thanks to its distinctive and beautifully-created cover image; a striking blue arcs across the cover like blood flowing from a sword cut, a Samurai warrior in his distinctive garb at the top of the image, accompanied by time-worn font displaying the title and author’s name. The second book in the series, procured from NetGalley for free in return for a review on my blog, is a continuation of the journey of Tengu, the young girl who travelled with the nameless Samurai. Having parted company with the veteran warrior she now journeys on alone, eventually coming to a sacred river shrine and a sort of gladiatorial tournament that promises bloodshed and, perhaps, fame as a triumphant warrior. I’d enjoyed the way that Baker developed Tengu in Winters Raven, and was keen to see where he would take her in this next novel, and how he would expand on her character and motivations. Once again, the first thing that struck me in the novel was the writing style and authorial tone that Baker has adopted for this series – it’s a slightly distant, almost formal style that makes one think of epics like those written by Homer, of the adventures of great warriors laid down on paper by scribes long after they’ve passed. It can take a few pages to get completely used to, but is eminently suited to the subject matter and the time and region where the book takes place, and is highly engaging. Another thing that rapidly becomes apparent is the swift and brutal finality of Samurai combat, and then the much longer period of resting, cleaning weapons and equipment, and even caring for a dying opponent, as seen in the opening pages of Raven’s Sword. Baker deftly highlights the highly intimate yet simultaneously strangely impersonal nature of these fights, which can allow Tengu to mortally wound a fellow wandering warrior, yet sit with him while he dies from the wound she inflicted upon him. Measuring sword fights in heartbeats is a unique and engaging technique I haven’t encountered before, and makes fights highly memorable. Tengu continues to be an interesting character to follow as the novel’s protagonist. She’s a skilled warrior, as shown by the fight at the start of the book, as well as the events of Winters Raven, and yet despite her undoubted abilities, the patriarchal and feudal nature of Japan means that society cannot accept her as anything other than a child or, eventually, a wife. So though she had fought many duels and battles, often against highly experienced warriors, she only encounters barriers in her attempts to train in the arts of the Way, the Samurai code. Those barriers are keenly demonstrated by Baker, who makes you instinctively sympathise with the constraints that Tengu is forced to live with, and her frustration at being incessantly ignored by male warriors, monks, and even lowly labourers just because of her gender. Frustrated in her attempts, Tengu decides to leave her journey to the gods, and after travelling some miles encounters a Monk – a fearful warrior, but one crippled by a recurring back injury. It was certainly an unusual character trait, and I enjoyed how wonderfully random such a situation was; but after some initial smirking, I became engrossed as Baker cleverly uses the relationship between the two fighters to further explore the fractured nature of Japanese society during this tumultuous period. Their conversations and exchange of anecdotes provide revealing insights into how the class-based nature of the feudal society has been ruptured, and how the upper classes have drawn on increasingly-desperate ruses, such as folk tales, in an attempt to recapture the power they once held. These conversations come out organically, as a way for the two strangers to relate to each other; they’re hugely informative, yet not in a way that appears as an information-dump because the author has miscalculated the narrative pacing or word count left to utilise. That level of authorial skill continues on through the book, elevating many different aspects; but perhaps none more than the fight scenes that Baker writes, which I’m pleased to report continue to combine his flair for describing fights in a way that is simultaneously detailed and brutal. Limbs are removed, stomachs sliced open, and the inherently fatal nature of fighting with razor-sharp blades wielded by expert warriors continues to be demonstrated in fast-paced, almost lyrical prose. Each fight, planned or not, is genuinely a joy to read, especially given the way in which Baker is at pains to highlight how quickly these contests were usually over and the messy death (quick only if the loser was especially lucky) that was the result of combat. The plot in Raven’s Sword begins simply enough, with Tengu travelling with the Monk to a mysterious duelling contest advertised across the region. Curiously the tournament seems to go against all the rules of the Way, the Samurai code, and fights are with blades, and to the death, rather than traditional bamboo sticks that allow for injury but not fatalities. In addition, Baker weaves in the story of a family and their fatal encounter with a local Lord; a mysterious iron sword that a group of bandits seek to seize because of the ill-omened legend attached to it that their leader supposes can be turned to his advantage; and the political machinations surrounding a General who acts as the emissary of the Shogun, gathering forces to act against the Emperor and the many Lords and Chieftains that now rule a fragmented Japan. The plot progresses quickly and smoothly, with no wasted scenes or plot-filler; a number of action scenes break up the overarching plot, and I was actually surprised at the number of twist and turns that Baker introduces, particularly around the ownership of the cursed sword, and the various Samurai, Ronin and other warriors who attend the tournament. Barker certainly puts Tengu through the wringer, emotionally and physically, and she’s a much different person by the end of the book; it’ll be interesting to see where Baker takes her given what she’s both lost and gained in such a brief period of time. Taken all together, Raven’s Sword is hugely enjoyable, and by the end of the novel I found myself comparing it to authors like James Clavell. Although the scope of the plot is much more focused than Clavell’s legendary novels, Baker introduces the same well-developed characters and sharp eye for an engaging plot, that merges with a fully-realised and well-researched version of feudal Japan that becomes a joy to travel through with Tengu and the other characters. That research shines through the novel, and amazingly Baker has even gone the extra mile and provided a bibliography that allows the reader to see what books Baker used in his research, should they wish to read further into the subject matter. I wish more authors did this and didn’t just take the reader’s knowledge and understanding for granted, and shows the respect Baker has for his readers. To come to a conclusion, adept prose linked to an engaging narrative, intense, brutal and lightning-fast sword fights, captivating characters (both protagonists and antagonists) and a brilliantly-realised version of 14th Century feudal Japan all combine to make Raven’s Sword one of the best pieces of historical fiction I’ve ever read, somehow even managing to better its predecessor. I eagerly look forward to the third title in the series, and to witness whatever journey Mr Baker takes Tengu on next.